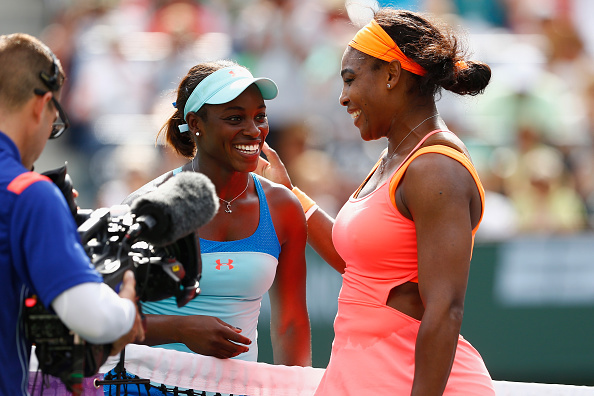 Sloane Stephens: Disparity in results soon to be history? At the Grand Slams, American number three Sloane Stephens already has one semifinal, one quarterfinal and several round of 16 appearances to boast, making her a name to watch out for in the draws of the big events. However, she has been unable to replicate those results away from the big stage where she is expected to do well every so often till July last year when she finally won her first title. Known for her powerful ground stokes and precise shot-placement coupled with athleticism and an all-court game, world number 21 Sloane Stephens clearly loves the big stage. Her best results at the Grand Slams include a semifinal appearance at the 2013 Australian Open, four straight round of 16 appearances at the French Open dating back to 2012, a quarterfinal and round of 16 appearance at the Wimbledon Championships and US Open respectively, both in 2013. However, the WTA International-level (lowest tier) events have generally not been a very happy hunting ground for the American who cites clay as her favourite surface. From April 2010 to July 2015, Stephens has appeared in the main draw of these events approximately twenty times, with her best results being just three quarterfinals and four semifinals, a far cry from her success at the higher-tier events. While Jelena Jankovic is one of the best players to have never won a Grand Slam, Stephens was once known as one of the best players to have never reached a final let alone win a title. 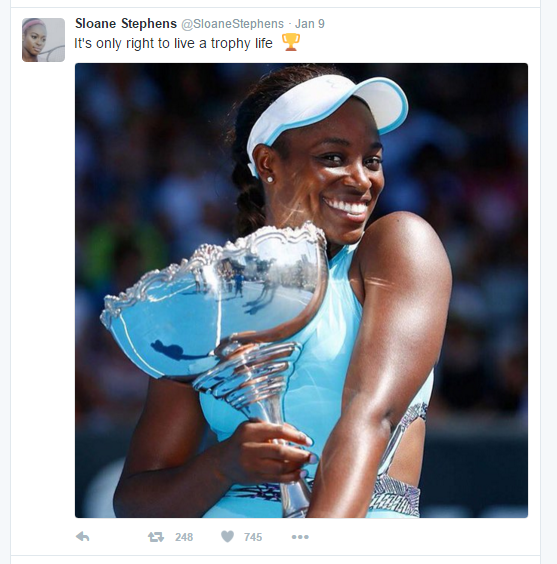 During the fall of 2015, she finally landed her hands on her first trophy when she won the Citi Open on home soil in Washington D.C..
Stephens at the 2011 French Open, her first Grand Slam tournament. Photo credit: Jacques Demarthon/Getty Images. The American made her Grand Slam debut in 2011 at the French Open as a qualifier but ended up being overwhelmed by Brit Elena Baltacha in the opening round in straight sets. She then made her first WTA quarterfinal at the Premier-level Mercury Insurance Open in southern California. At the US Open, Stephens who gained direct entry beat Reka-Luca Jani and upset 23rd seed Shahar Peer to win back-to-back matches for the first time in just her second Grand Slam appearance before being dispatched by 16th seed Ana Ivanovic. The run sent the young American into the top 100 for the first time in her career, rising from 106th to 89th. In 2012, Stephens made the second week of a Grand Slam for the first time when she swept past Ekaterina Makarova, Bethanie Mattek-Sands and Mathilde Johansson to reach the round of 16 of the French Open but was stopped by former finalist Samantha Stosur. Her other Grand Slam results that year include third round showings at the Wimbledon Championships and US Open. Throughout this three-year period, Stephens' best results at the International tournaments were semifinal appearances at the Internationaux de Strasbourg (her first WTA semifinal) and the Citi Open, both in 2012 where she was stopped by eventual champions Francesca Schiavone and Magdalena Rybarikova respectively. In her other seven main draw appearances at such tournaments, she lost before the quarterfinals. 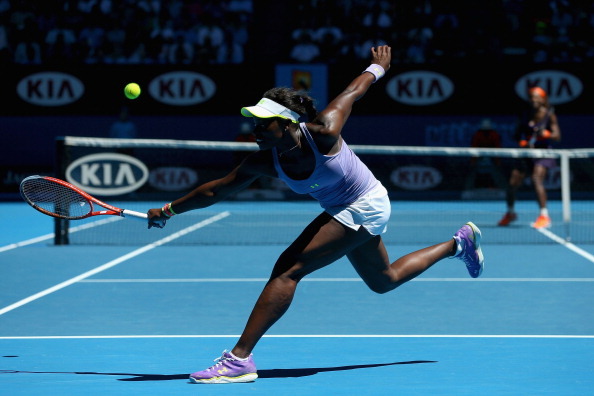 Stephens returns a backhand to Serena Williams during their quarterfinal match at the 2013 Australian Open. Photo credit: Julian Finney/Getty Images. Her career breakthrough came at the 2013 Australian Open. Having entered the tournament as the 29th seed, Stephens beat future world number two Simona Halep, Kristina Mladenovic, fellow rising star Laura Robson and Bojana Jovanovski to enter her first ever Grand Slam quarterfinal. Going up against compatriot and heavy favourite Serena Williams, Stephens defied the odds by handing the world number three Williams her first quarterfinal loss at a Grand Slam in almost three years. Her fairytale run was ultimately ended by world number one defending champion Victoria Azarenka, who went on to defend her title but it sent the American into the world's top 20 for the first time in her career. Stephens continued to deliver at the Grand Slams that same year by reaching the second week of the other three. Most notably, the quarterfinals at Wimbledon where she was swept aside by eventual champion Marion Bartoli in straight sets. 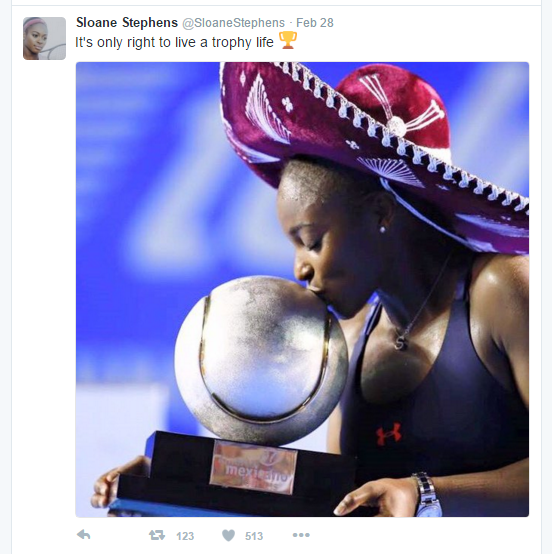 Stephens garnered a 15-4 record at the Grand Slams in 2013, a foundation which led to her best season finish to date at world number 12. Her other significant results include round of 16 appearances at Miami, Rome, Toronto, Cincinnati and Beijing coupled with quarterfinal showings in Brisbane, Brussels and New Haven. The American played a meager four International tournaments in 2013. At the Hobart International, Stephens was the highest-ranked player left in the semifinal stage but was upended by eventual champion Elena Vesnina. At the Citi Open, the second-seeded Stephens suffered a puzzling first round loss to 88th-ranked Olga Puchkova of Russia. She concluded the 2013 season by competing indoors at the Generali Ladies Linz and BGL Luxembourg Open but was sent packing in the quarterfinal stage of both tournaments by Stefanie Voegele in three sets despite being one of the clear favorites for the title. Stephens and Halep embrace each other at the net after their round of 16 match at the 2014 French Open. Photo credit: Clive Brunskill/Getty Images. 2014 was definitely not the best season for the American as she struggled to cope with backing up her stellar 2013 and a wrist injury which resulted in inconsistencies, finishing the year inside the top 40 along with a 21-20 record as opposed to 40-23 the previous year. Her best results of 2014 did not come up at the Grand Slam level but at the Premier Mandatory-level BNP Paribas Open and the newly-promoted Premier tournament, the Aegon Classic in Birmingham where she logged in quarterfinal appearances. Her best Grand Slam results came with round of 16 showings at the first two Grand Slams of the year. At the Australian Open, she once again lost to Azarenka while at the French Open, she was defeated by eventual finalist Halep. Her run of six consecutive second week appearances at the Grand Slams was then ended by Maria Kirilenko in the opening round of Wimbledon, the first time the American lost in the first round of a Grand Slam since her main draw debut in 2011. She also lost early at the US Open to Johanna Larsson in the second round. Just as she thought she could look at the International tournaments to salvage her season, Stephens faltered, losing in the opening rounds of all four tournaments with the worst loss ranking wise coming against world number 129 Mariana Duque-Mariño in Bogota. Stephens and Serena Williams at the net after their round of 16 at the French Open last year. Photo credit: Julian Finney/Getty Images. Stephens' performance at the Grand Slams in 2015 was her worst since 2011. A fourth consecutive round of 16 appearance at the French Open where she nearly scored her second win over Serena Williams was her best Grand Slam showing. She lost to Lucie Safarova in third round of Wimbledon and bowed out in the opening round of the other two Grand Slams. In other big events, she finished Indian Wells and Miami in the round of 16 and quarterfinals respectively. She also reached the semifinals at the Aegon International in Eastbourne. In this aspect, Stephens saw her fortunes start to take a turn for the better. After falling before the quarterfinals in her first three International events, she reached the semifinals of Strasbourg once again where she lost to Stosur. At the Citi Open semifinals, she finally broke the aforementioned curse when she avenged that loss to Stosur to advance to her maiden WTA final. 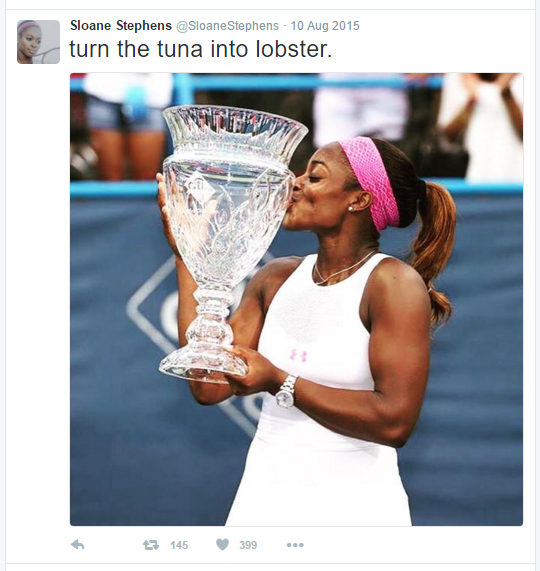 This title in Washington D.C. was enough to mask the fact that Stephens went on to suffer two more shocking losses later in the year at International events in Seoul (to world number 136 Aliaksandra Sasnovich in the quarterfinals) and Luxembourg (to Mona Barthel in the opening round). Stephens finished the year at 30th in the rankings. Stephens has already won three titles in 2016 namely, Auckland (left), Acapulco (middle) and Charleston (right). Photo credit: Auckland (Phil Walter/Getty Images), Acapulco (Miguel Tovar/Getty Images) and Charleston (Volvo Car Open). Breaking that curse seemed to have given Stephens a new sense of belief in 2016 that she can now win titles. Although she bowed out in her opening matches at the Australian Open, Indian Wells and Miami, she became the first player to win multiple titles (a feat no one expected her to achieve) when she won the Abierto Mexicano Telcel in Acapulco, having won the ASB Classic in Auckland earlier in the year. Sloane Stephens' season of 2016 thus far may be go big or go bust, striking a rather similar pattern to her previous years' results but the distinction is that she is winning titles. Could winning the biggest title of her career put an end to the disparity in results she has endured for most of her career and rack in more titles? A feat worth noting is that last year's champion in Charleston, Angelique Kerber went on to sweep three of the next four Premier-level events namely the Porsche Tennis Grand Prix (clay), the Aegon Classic (grass) and the Bank of the West Classic (hard). Is the American destined for more titles in the coming months? Another good question is will this finally be the season where she starts to produce good results at tournaments big and small on a consistent basis? If she does, she may well find herself in the top 10 for the first time in her career by the conclusion of this season. 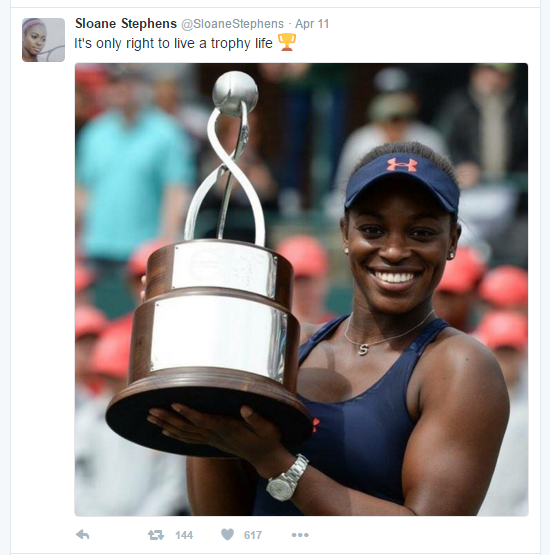 For a player with so much talent and potential, it is only right that Sloane Stephens achieves equally consistent results at all tournaments she play and also live a trophy life.